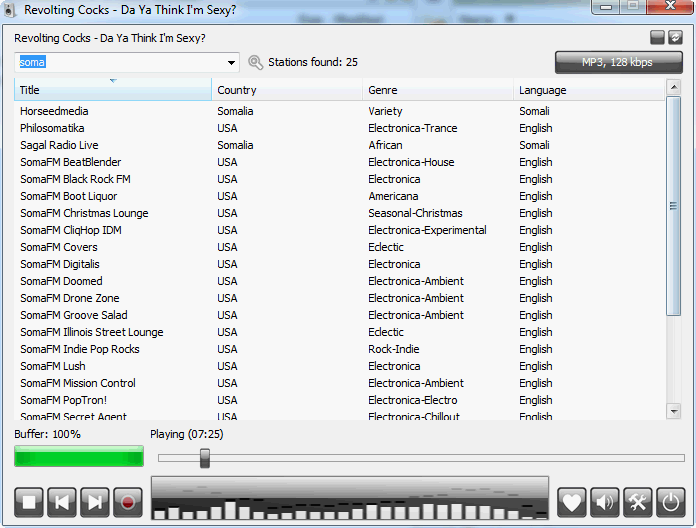 I enjoy Radiosure player, but the default skin always seemed cramped to me, because the columns in the station list were never fully shown. This is a modification of the standard Radiosure skin. 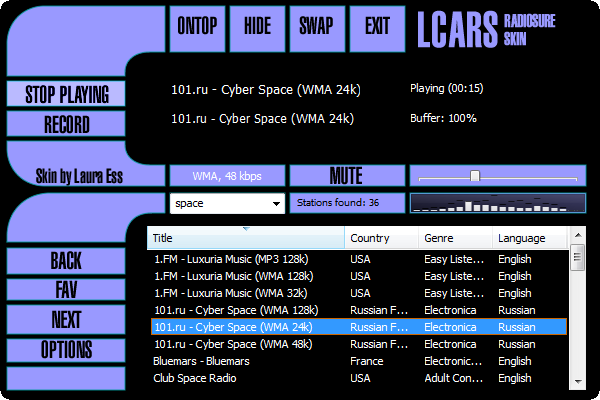 It makes the main window taller and wider and fills the new space with an enlarged station list. The “stay on top” button has also been added. This skin is based on a character from the Oz series of books, called Polychrome, who the daughter of two rainbows and made magic while she danced. I liked the Neil illustration (originally used as an end paper in the books) and coloured it. I though Poly, as a mad dancer, was perfect to hold a list of radio stations. 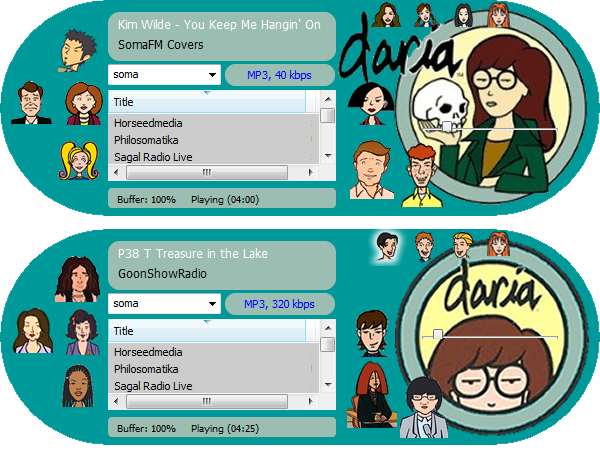 This skin is based on the MTV show Daria which aired between 1997 to 2002. The intent of the skin was to reflect the characters of the show, and images for the buttons were selected on that basis. There is no minimised version as such, but an alternate version of the skin (which shows less common characters) that you can swap between.. This LCARS skin is based on the computer Interface used in StarTrek: Next Generation, StarTrek: Deep Space Nine, and StarTrek: Voyager. This interface is alternatively known as “Okudagrams”, after scenic art supervisor and technical consultant Michael Okuda, who designed the system. Details of LCARS can be found at the wikipedia and elsewhere. I have attempted to conform this skin to guidelines for LCARS found on the net and used the colours suggested at Lcars Standard Colors. The underlying design is based on an LCARS alarm clock design, part of the LCARS 24 by Bill Morris. Mainly, I used this to make sure that I made no obvious design errors in this skin. As a Trekker from way back, I wanted to look to be correct! I opted for less colours rather than more, since it is clearer. The minimised version is not that small, but the main purpose of LCARS is not smallness, but clarity and structure. Bubble design skin – First attempt at a skin. This is a simple skin with orange texts and buttons over a tech glossy background. It’s like a home sound system, on wich we have light indicators and visible buttons. DX-210, for RadioSure v2.1.969, is a “tabletop” receiver, with “hand-held” remote control, for serious Internet radio enthusiasts. Designed with emphasis on utility, the receiver dimensions of 800px(W) x 540px(H) provide for relative ease of station search and selection, display of most texts without truncation, and built-in screening of program images (where available). It features an attractive brushed aluminum front panel with grey steel enclosure, and a logical control layout that simplifies operation. Thanks to Admin at The BestWare Studio for allowing our adaptation of buttons from the Standard skin for use in the DX-200 Series. PANTER skin from borko1dj. Thank you! Very interesting idea of the skin from borko1dj. Thank you! It’s not perfect, but hope you like it..